Hip-Hip-hooray! 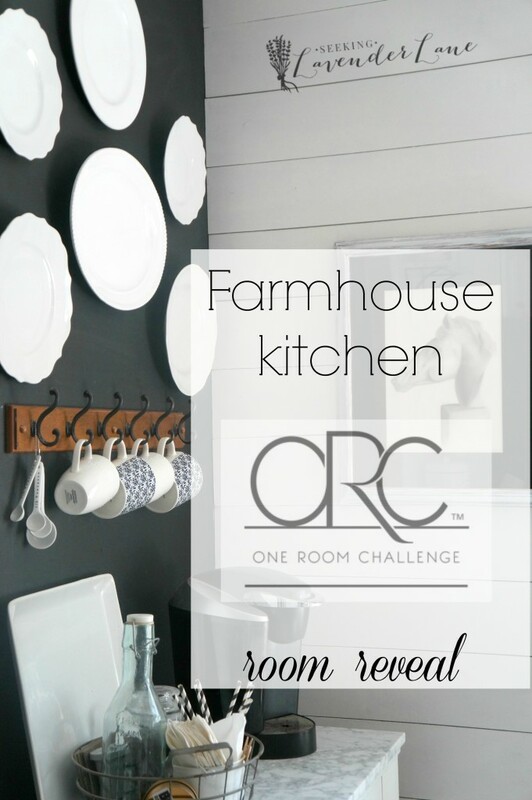 It’s week 6 of the One Room Challenge, and we can now finally take a breather. I am so excited not only to share my kitchen reveal with you all, but to see all the other reveals this week as well. Be sure to visit all the link ups to Week 6 where most of us will be sharing our room reveals. Where did six weeks go? Honestly, its like we were just starting…and here we are at the reveal. 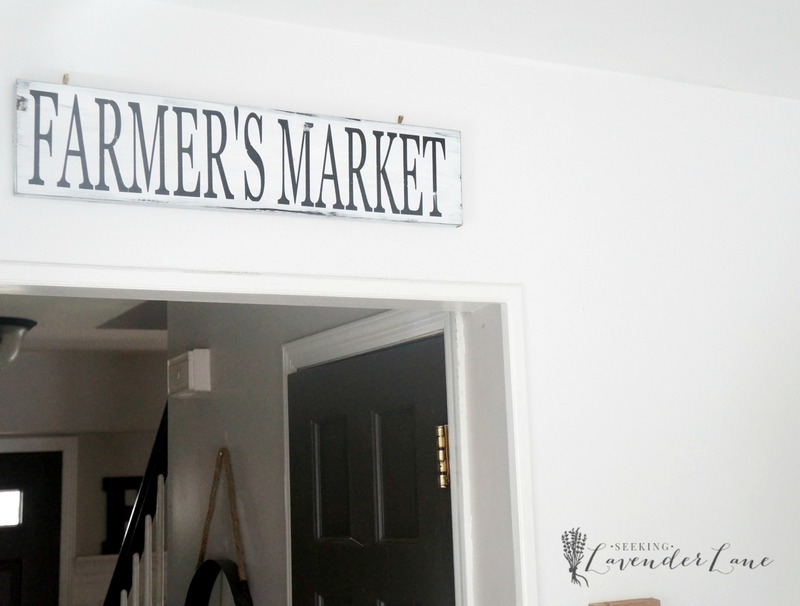 It now just feels like the perfect Farmhouse Kitchen for our family. Let me take you back to each week so you can see the progress of our kitchen. I kind of never went over my checklist with you, so let me walk you through what we did, and what we never finished. What a list! I mean so much has happened in here that the kitchen space, really looks and feels like a totally new home. I of course kept my Chalkboard Wall, which we did last summer. 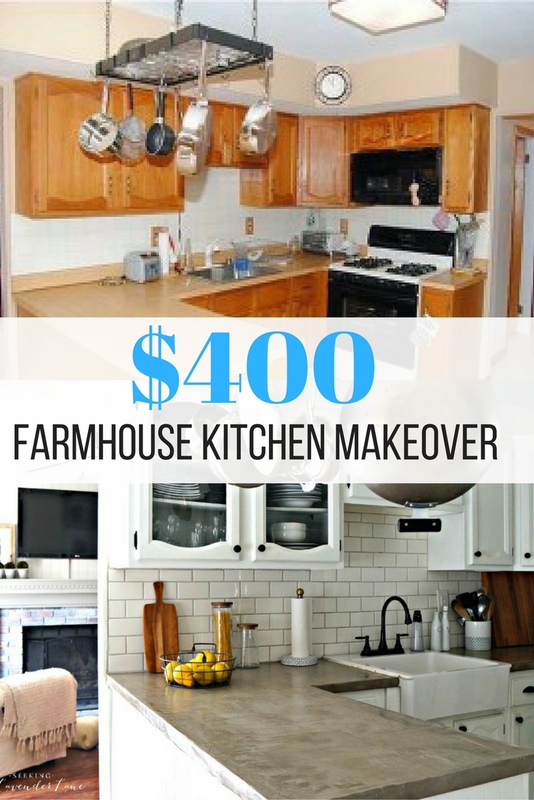 It kind of was the makeover that pointed me in this direction for more of a french farmhouse kitchen. Before the kitchen felt a little more Americano Farmhouse. Though I loved parts of that too, I am always just drawn to that Parisian feel. So here we are and I am basically there. The only last makeover piece would be the Bistro Cart. 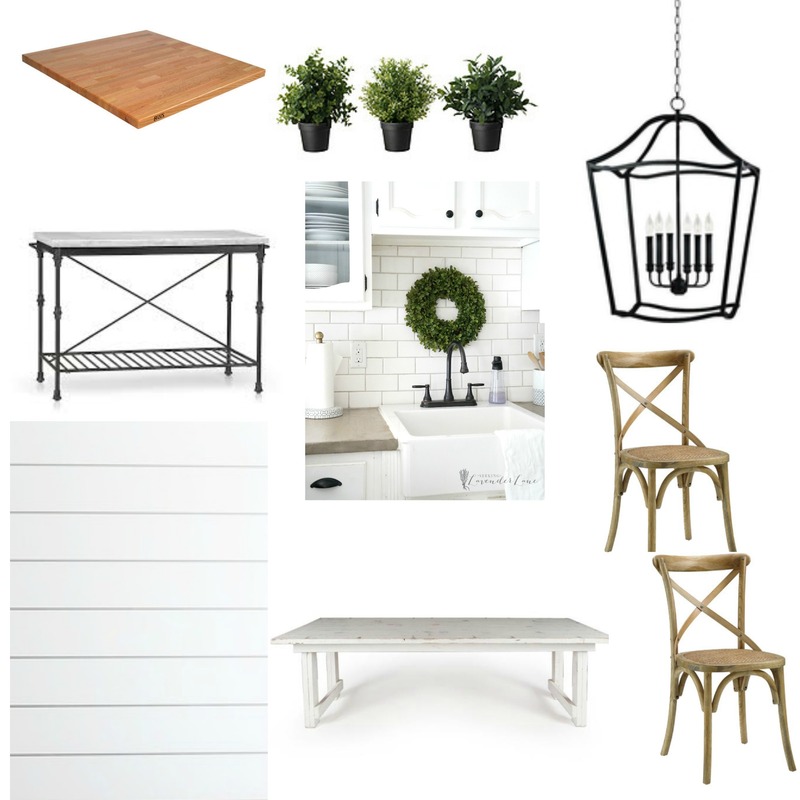 I shared on the above Design Board that gorgeous Bistro table I had found online. Of course the price tag was wayyy out of our reach, but I thought I would try to make my own version with a little DIY help. Unfortunately, it was a failed DIY and so we just painted our existing sewing machine table, put the marble we had purchased on top (for now) we will eventually update once I find the right vintage table, or we may try another DIY method. I’ll update you all on that when that happens. Well that’s about it! Unless I convince the hubby to officially re-tile our kitchen, I think that will be all the updating that happens in here for a long time. 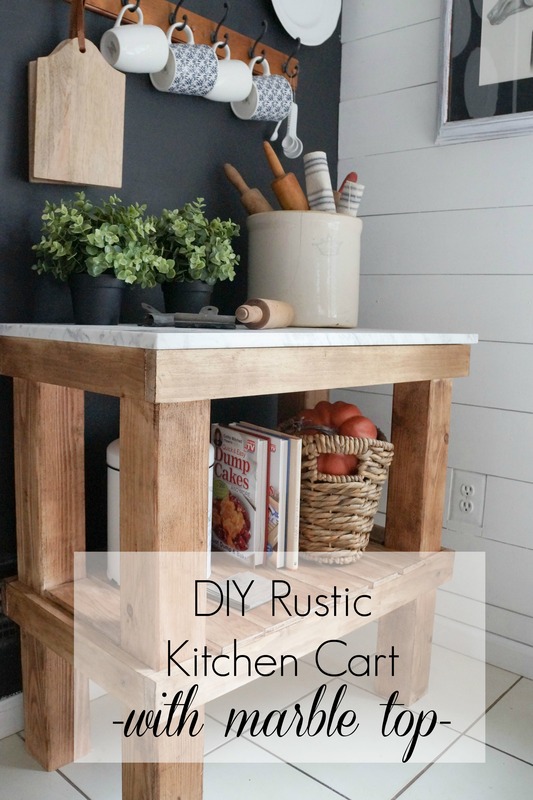 I hope I am just sharing how much DIY can make a difference in a home. You don’t need a full custom kitchen or expensive tile or brand new furniture to make a home look beautiful. Everything was done on a major budget from the hand-me-down cabinets (free) the Vintage find table ($160), some whole sale marble ($175), Paint, a few accessories, and of course a new light fixture (which I am blessed to have sponsored by the fabulous Lampsplus). By creating a DIY built in bench (though we had to pay for the wood) it was for sure a way to save. Instead of purchasing, 4 or 6 chairs keeping just the two new ones and the bench helped keep the budget down. 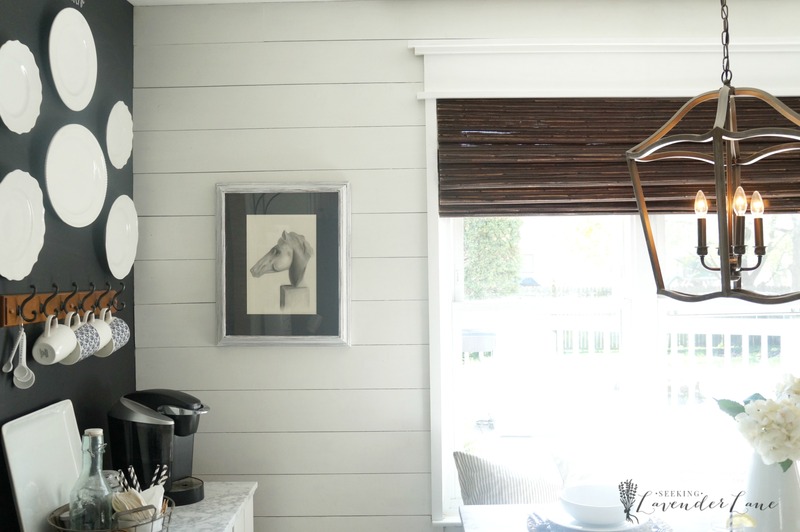 The shiplap walls add dimension and character and cost us less than $40! Now for the photos. Let me know if you have any questions in the comments about the makeover I’d love to share! I decided to take pictures with the table with out the drop leaf up and with the table up and set. 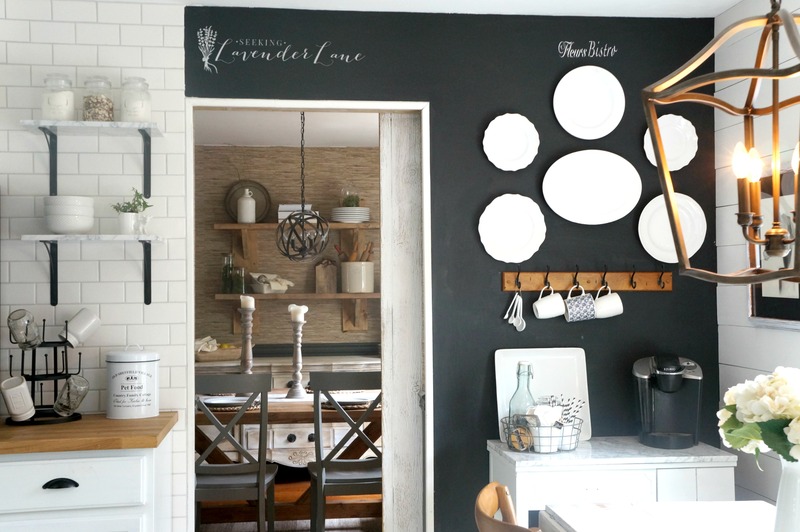 Chalkboard Wall, White plate gallery wall, coffee nook. Thank you so much Amanda! You have been so sweet leaving me comments the entire ORC process. Can’t wait to stop over and see your room! Thr rom is so goreous!! I just love everything! This is my dream kitchen! 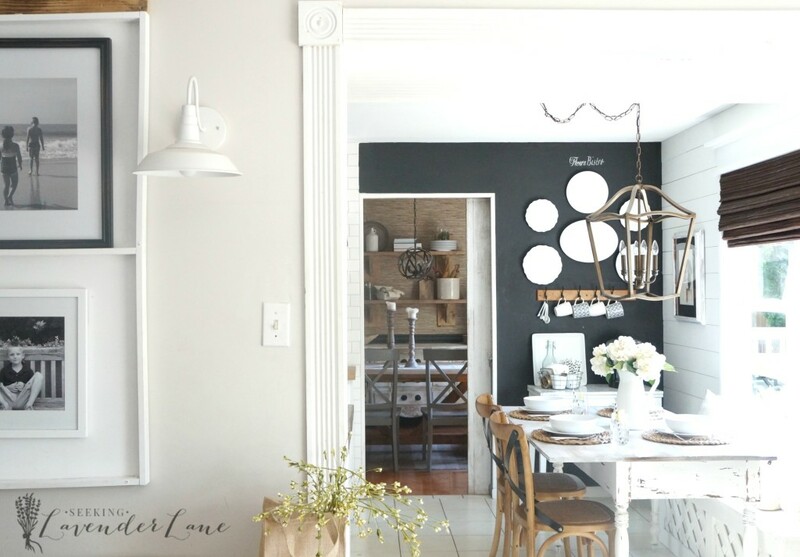 Do you mind sharing what color you used for the black wall in the breakfast room? Thanks Emily! That means so much! I appreciate you stopping by. WOW! It’s stunning!!! 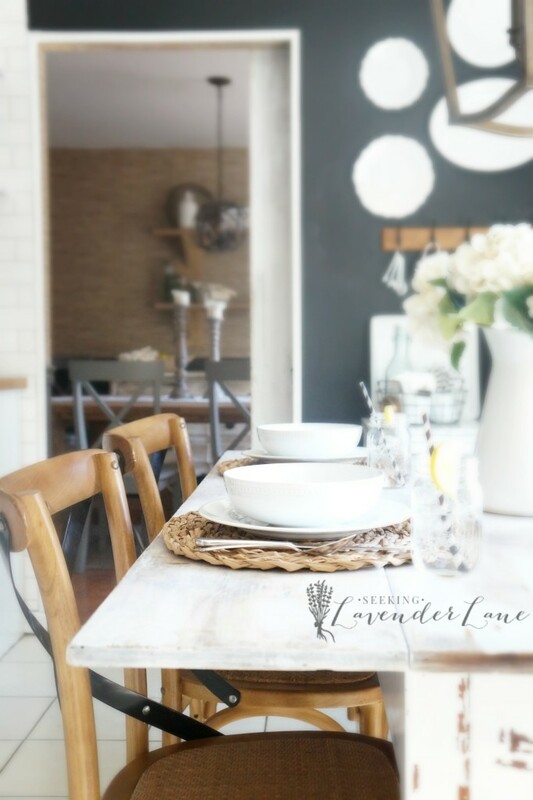 That table still has me swooning and looks so perfect under that pretty chandelier! It’s all so gorgeous!!! Thank you so much Kristi! Thank Cecilia! That means so much! You knocked this out of the park! 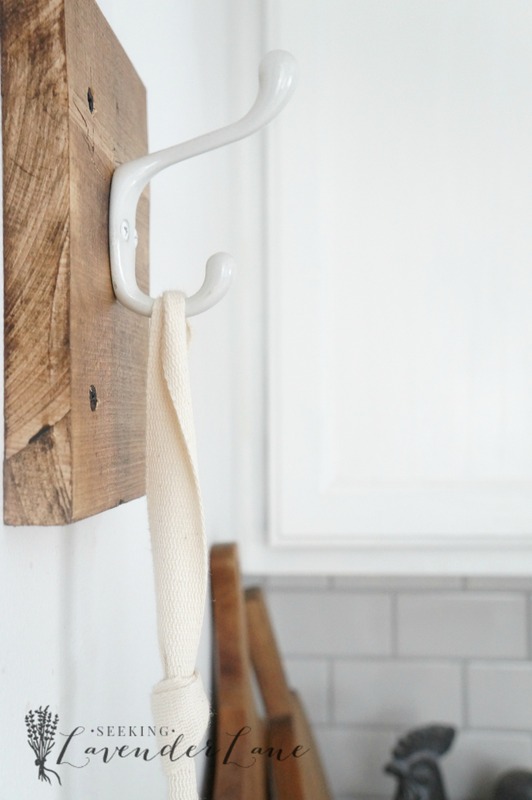 Love all the little touches throughout but I think my favorite is the single apron hook – so smart and just a sweet touch. Awesome job! ashley@biggerthanthethreeofus recently posted…How To Clean Siding Without A Power Washer! Thanks Ashley! : ) Sometimes it’s the simple touches! That corner felt so blah, so it needed a little something, and I love how it also fills it with purpose. Gorgeous! You did a great job. Nothing like a tight deadline to get everything done, huh?? That is what I need to get my tail in gear 🙂 It is a beautiful kitchen! I know you feel very proud and relieved to have it done! It looks incredible, Deb! Bravo! Thank you so much Hillary! This is gorgeous Deb!! I Love everything! 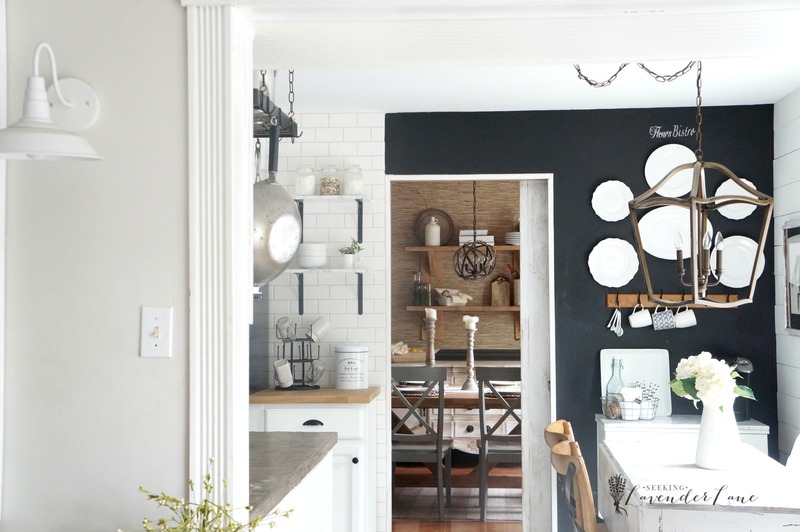 Especially the light fixture and those faux marble shelves. Beautiful job! Thank you so much Lindi! 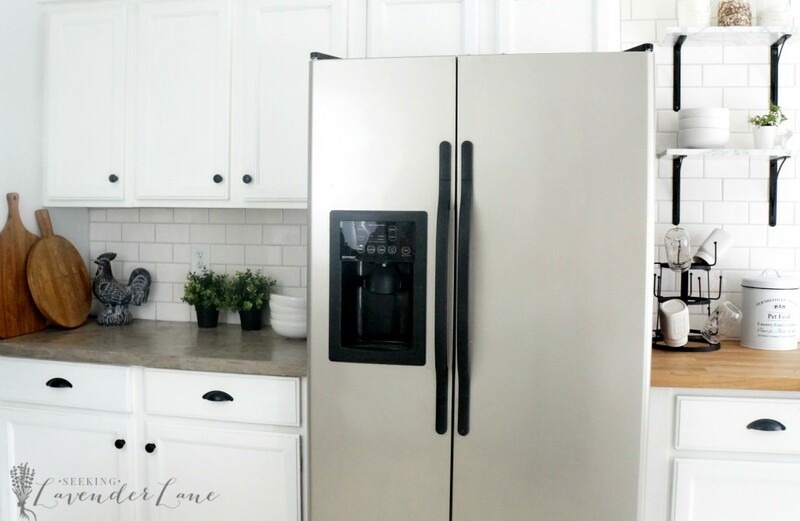 Your kitchen looks absolutely gorgeous! 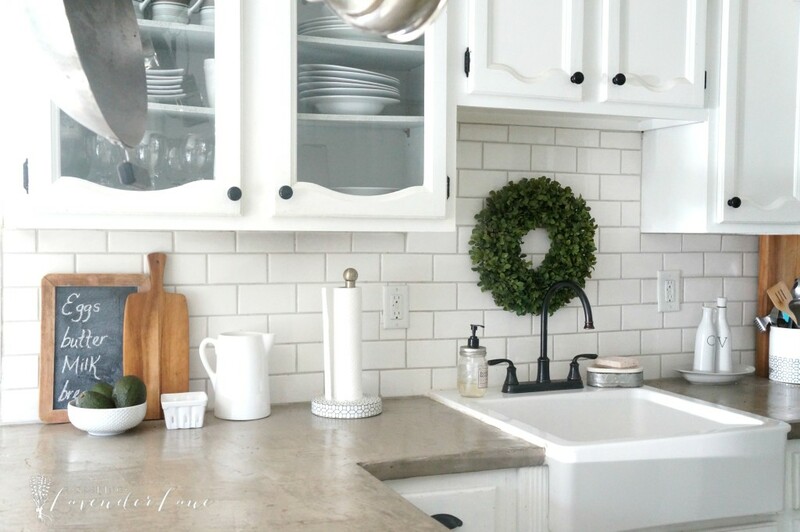 I so badly want a white kitchen… next One Room Challenge? Beautiful job! Thank you so much Erin! Yep, you’ll have to go for it! Deb, this is just beautiful I love everything you did! 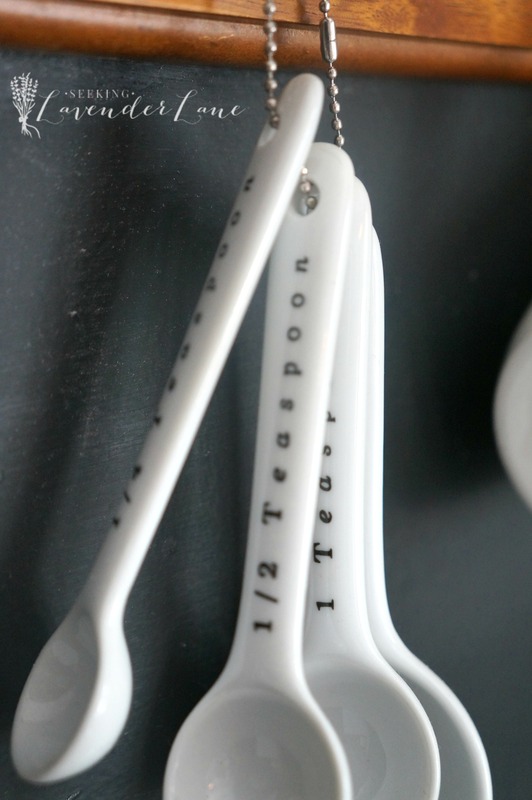 Those kitchen chairs… I’ve wanted those forever! Thank you so much Roxanne! Can’t wait to stop on by your page now and see your reveal! What an amazing transformation! 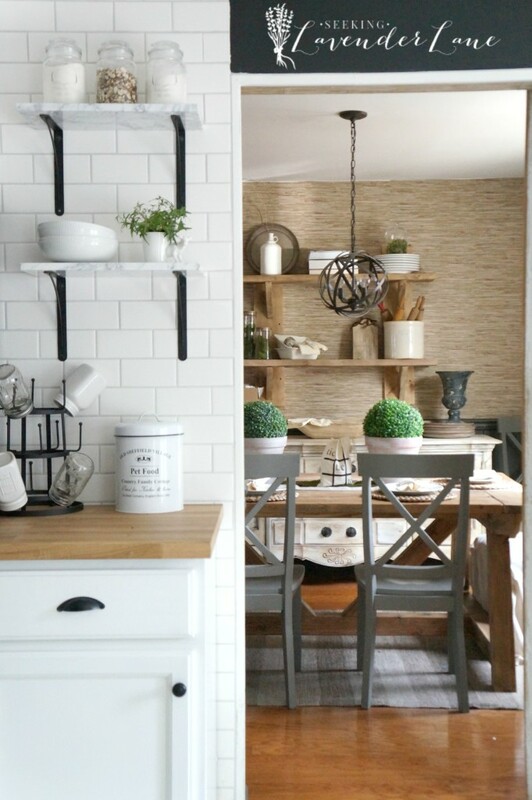 The kitchen looks incredible…loving the subway tile with the marble shelves. Thank you so much Jenn and Vicki! It looks amazing! Your rooms always do look great though! 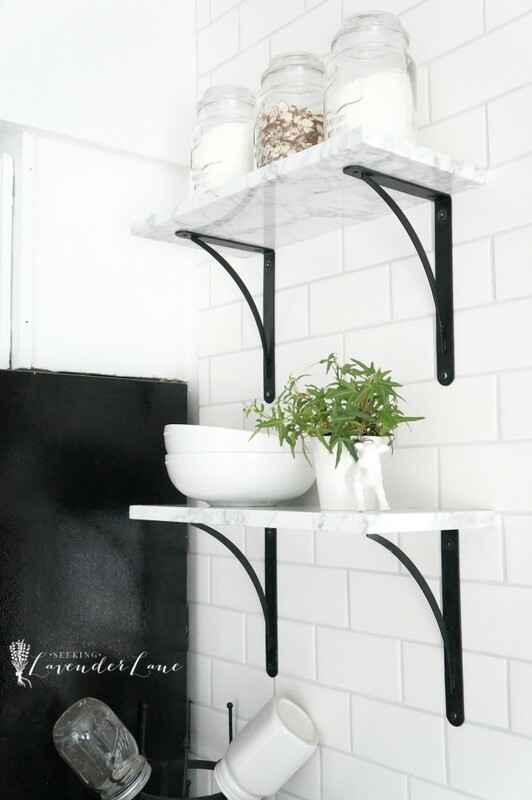 I think the marble shelves are my favorite part! 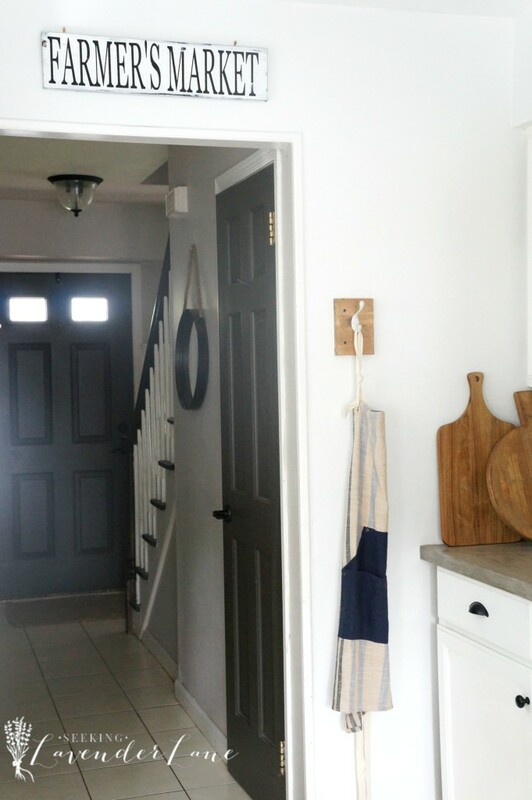 Amanda @ Old House to New Home recently posted…One Room Challenge: Week 6 The Nursery Reveal!! It turned out so pretty! 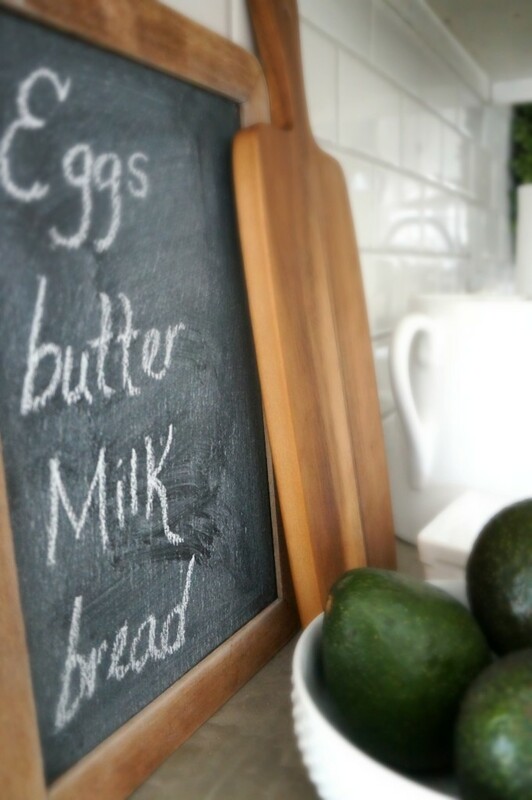 I love the chalkboard wall. It’s the perfect black tone! I love all of your choices. It is so fresh and inviting. I like how you used what you had and improved it. Great job. 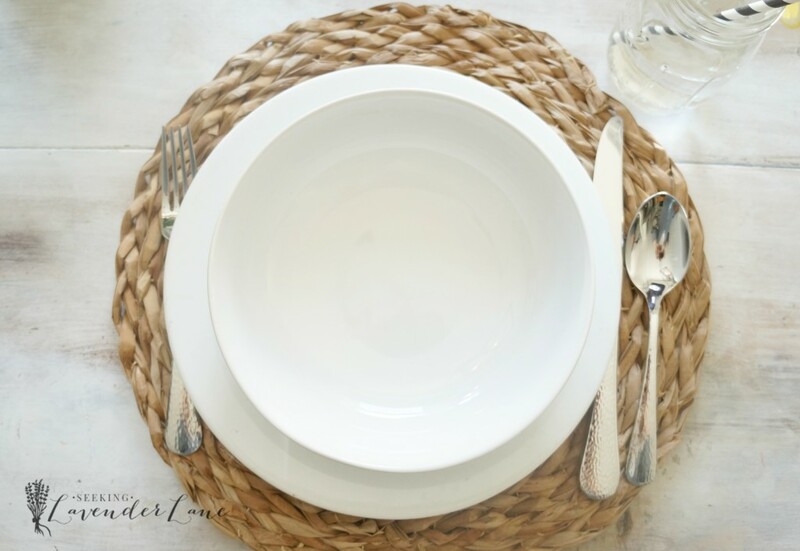 I also love the grasscloth in the dining room. It looks so pretty with your kitchen. Thank you Julie! Yep, always working on a tight budget, but trying to make everything still look pretty. Deb you did such a great job, it looks amazing!! Oh Deb your dining room looks so amazing! I love everything! I cant even choose my favorite! Thank you Sara, that’s such a huge compliment coming from you. Your room turned out so fabulous! 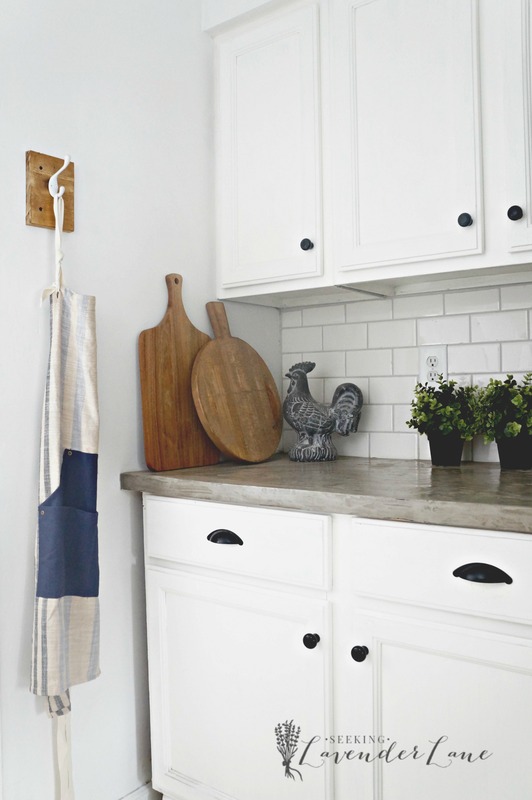 You truly achieved a very beautiful farmhouse kitchen dear! 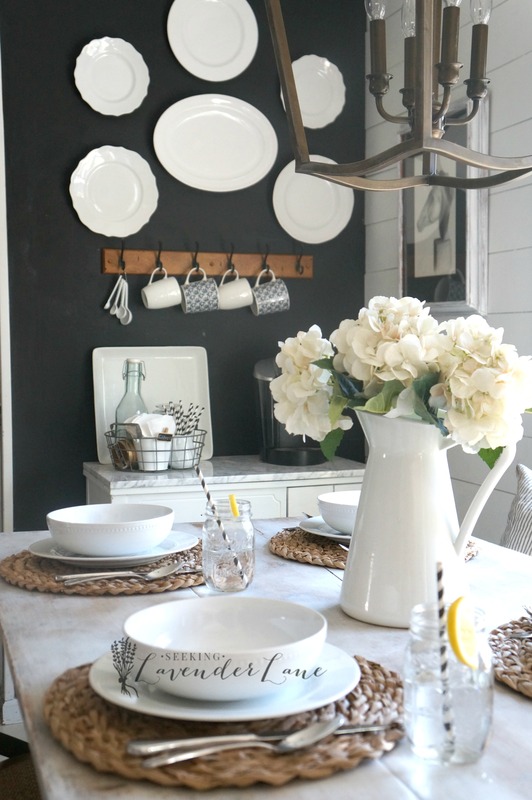 I love how you used black and white and all the gorgeous farmhouse details in your space! Congrats and Cheers to another room done! Thanks Vel! I appreciat your sweet comment! Thank you Elise, got to have a great coffee nook! This is just gorgeous!!!! I’m in love with that table and those shelves are truly stunning! 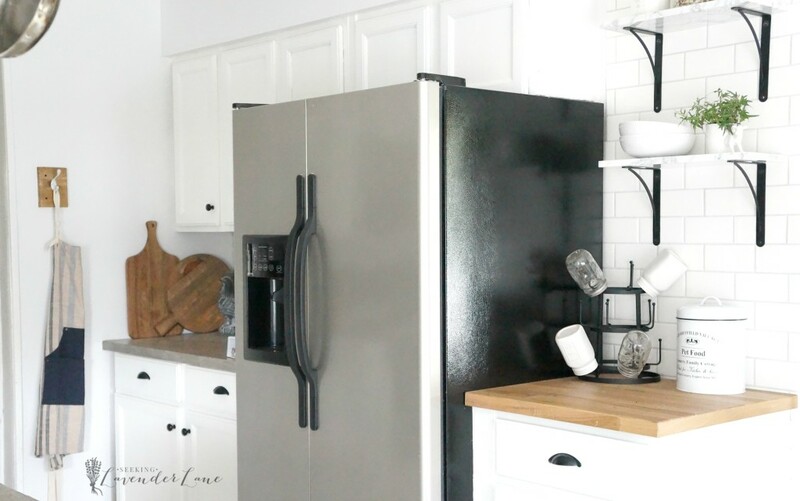 I’m blown away – what a beautiful kitchen! Love the black and white contrast. 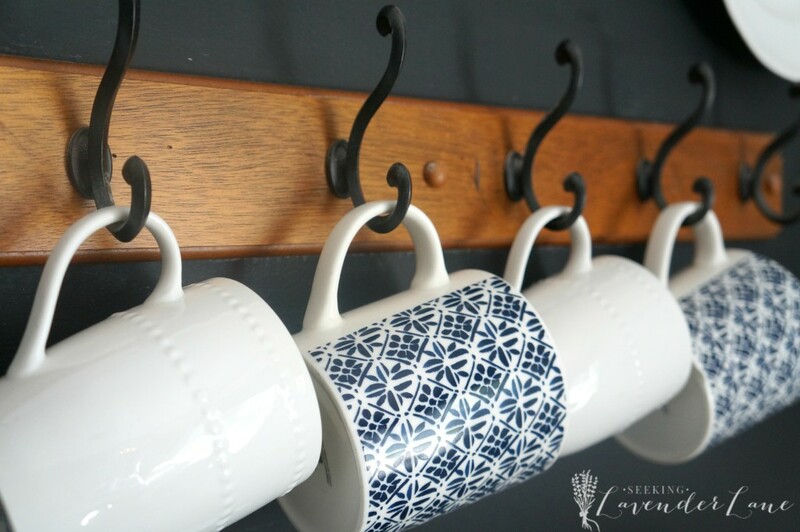 It works so well with the rest of your home! gah girl, you turned up! 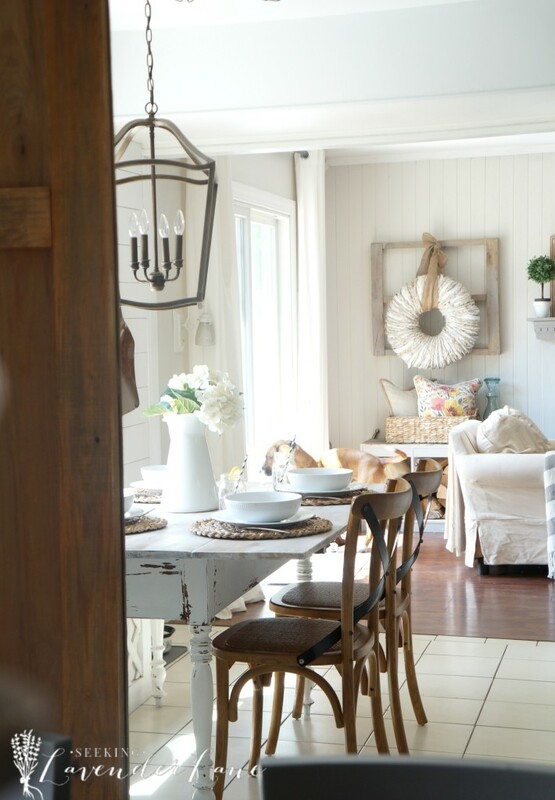 this is gorgeous and I love your take on the whole farmhouse style. Thanks Jess, you are truly the sweetest! I’m so glad you stopped by! 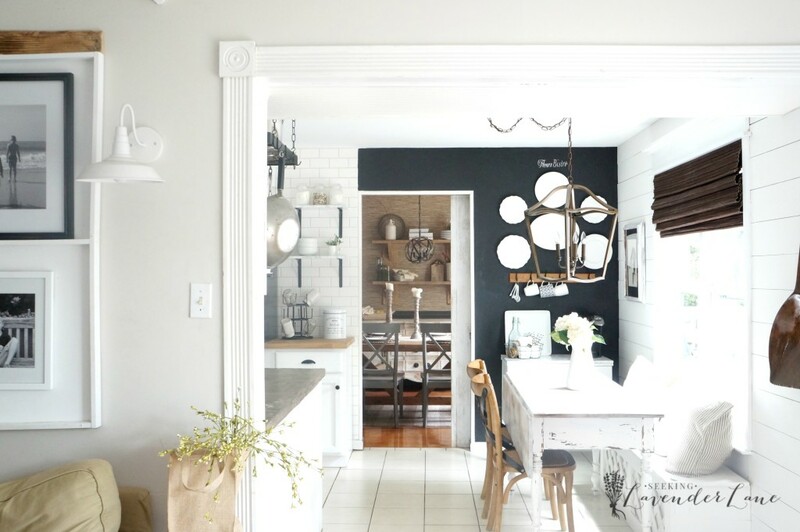 I love the black and white and that butcher block countertop!! We definitely like similar things!! Great job!! 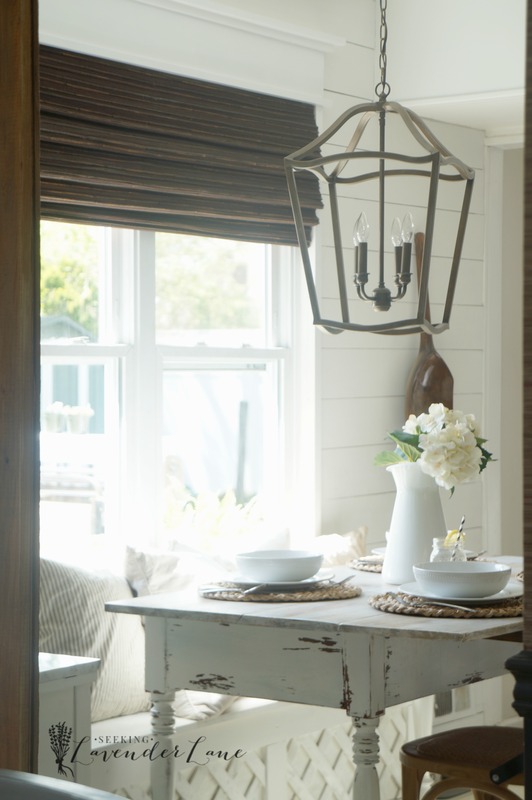 I just love the view from the kitchen to the dining room. ? Thank you Holli! : ) For sure, girl love your style! Your whole space looks incredible!! Love it! So pretty! It looks inviting and so nicely styled. Wow! It looks absolutely beautiful. Great job! Wow, this looks absolutely gorgeous. Love the coffee area and wall, the table, bench….everything. I love your decorating style. Well done, you must be so proud of your achievement and see your vision come to light. So pretty! I feel like I’m in someone’s little French farmhouse styled cafe! Love this! Where did you get your sink faucet? Thanks Sarah! It’s from Lowes. Oh what a gorgeous space! I love every detail! You made some beautiful choices and have such a gifted eye for style! Beautiful! I hope you have a great day! If you would like to inspire some more, Making Broken Beautiful is starting right now over at The Curator’s Collection and I would love to host you amazing talent! Wow, your kitchen looks absolutely astonishing! The color scheme makes the whole room look clean, neat, and fresh, and the accents and decor you’ve chosen really make the room unique! This whole look is just amazing! Very nicely done! Thanks so much for posting! Thank you Morgan! that means so much! 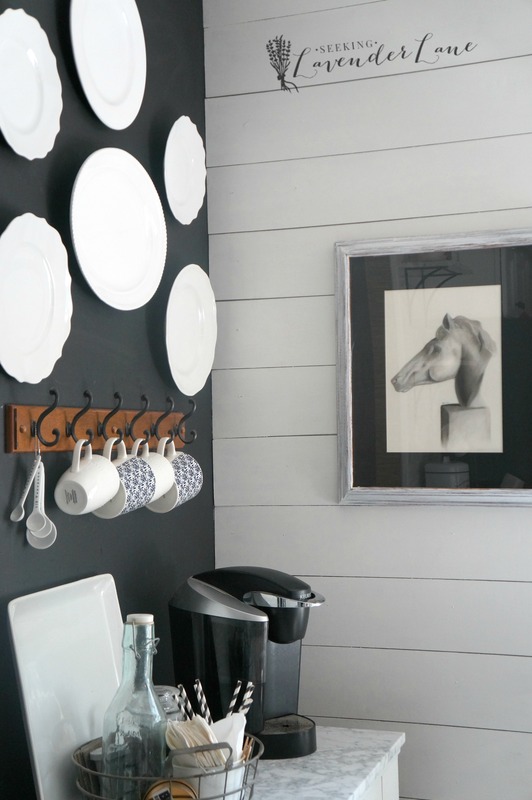 Yes, a small room needed a big punch of character and color especially with the contrasting black and white. We are loving it! Thanks you again! Are the counter tops sealed with the same Behr Wet Look sealer from your earlier post? The color is perfect and I’ve been looking for the right sealer for when I do my counters. Has it held up reasonably well? Thanks! Hi, yes same sealer! They held up really well. I do have to say that the concrete counters are quick to get oil stains. That’s probably the only complaint I have about them though. I love them and I love how easy, cheap, and beautiful they are! Thanks so much for your quick reply! The color of your counters are perfect and I wanted to be sure of the sealer before I do my counters this weekend. This was so helpful. Yay so glad this was able to help you out. Love to see how they turn out…send me a photo to my email if you’d like! Looks so good! I can’t believe I’m just finding you now. Can’t wait to see the reveal.